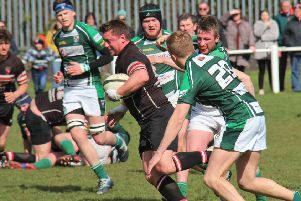 Heath’s promotion hopes were dashed by a 35-15 home defeat at the hands of Middlesbrough yesterday in their penultimate Yorkshire One match of the season. Second spot in the final table will go to Scarborough, who won 52-33 at Keighley, and the seasiders will have a play-off game for the chance to go up alongside champions York. The North Dean men made one change, bringing in Jordan Bradbrook on the wing against opponents who also had a chance of going up. In superb conditions, Heath got points on the board after seven minutes through an Ezra Hinchliffe penalty. Callum Harriett-Brown’s great run put Heath back on the attack and the same player was then held up from Jack Crabtree’s cross field kick. Great support play from Richard Brown and Chris Moore enabled Peter Birkett and Crabtree to link and Bradbrook was held short in the corner as Middlesbrough defended well. Only a superb cover tackle from Jason Merrie prevented the visitors from opening their account and then good drives from Lee Brown and Chris Moore led to Hinchliffe breaking through. Crabtree was sin binned for a high tackle and the half ended with the visitors on the attack but 3-0 down after a hard fought 40 minutes. Chris Piper came on for Olly Cook and the second half was only minutes old when the visitors’ full back sustained a broken leg in an innocuous-looking tackle. The game was delayed while an ambulance was summoned but the break seemed to inspire Middlesbrough. Play re-started with a scrum and they drove forward to score under the posts and take a 7-3 lead after 43 minutes. Heath seemed to have lost momentum and a visiting winger danced his way through a static home defence for another converted try on 47 minutes. Jordan Moana replaced Matt Beasty and Crabtree returned from the bin but the Heath defence was stretched again and a third converted try in the corner made it 21-3 after 52 minutes. Middlesbrough added a bonus point try on 57 minutes and at 28-3 it was game over and Heath were stunned. Si Brown replaced Cameron Ramsden as Heath tried to find a spark to re-ignite them. Bradbrook and Harriett-Brown took play to within 20 metres of the visitors’ try-line and the support was there, Jason Merrie touching down for a converted try with 15 minutes remaining. Heath went looking for another score but a looping pass was intercepted and Middlesbrough ran in a fifth try to kill the game at 35-10. Lee Brown won line out ball and Jordan Moana scored an unconverted try but Heath’s attempts to gain a bonus point try were unsuccessful when Moana, Hinchliffe and Sam Pollard were tackled short.